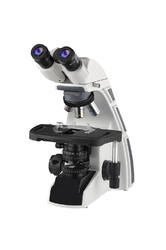 Our range of products include vision measuring system, gem testing gemology darkfield 7-45x zoom stereo led microscope with darkfield 1.3mpix camera, advance binocular research microscope, research digital microscope, binocular microscope for teaching and penta head teaching microscope. Highly precise metal base and column. 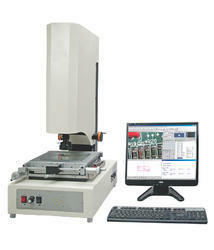 Superior measurement accuracy and repeatability for tight tolerance application. Unmatched illumination flexibility for difficult measurements. Powerful, flexible software for programmability. Advanced mechanical design resulting in high speed & accuracy. Manual operation with quick-moving stage. WESWOX Gem Testing Gemology Darkfield 7-45x Zoom Stereo LED Microscope with Darkfield 1.3Mpix Camera. Professional Gem Testing Gemology Microscope Excellent Optics ruggedness & versatility Patented Gemology Stand Transmitted & Reelected Fluorescent Illumination For distinguishing genuine & limitation Gems Inspect inclusions To judge Production origin & polishing Excellent to explain & exhibit to customers & jewellery shop Brightfield & Darkfield Illumination with gem clamps Adjustable goose-neck rectangular epi illumination Can also be used in Geology & mineralogy to clarify crystal structure Zoom ratio of 1:6.4 Ergonomically professional design. § Ergonomic Siedentopf Binocular head inclined at 30o rotatable at 360º. Suitable for eyepieces upto field of view 20mm. § Diopter adjustment ring on ocular tube. § Interpupillary distance 48-75mm adjustable. § Standard ergonomically designed rugged stand for long time comfortable usage. § KEOWA WF 10x/FOV 18mm (PAIRED) with high point and eyeguards offer maximum resolution and high colour fidelity as all of them are A.R. coated and perfectly designed for a FLAT FIELD. § Dust proof Quadruple nosepiece revolves on ball bearing with rubber grip and positive click stop. § Cross movement travelling range :75mm X 30mm. § Focusable Abbe Condenser centerable NA 1.25 with rack & pinion, aspheric lens, swing out filter holder, Iris Diaphragm with BLUE filter. § Built-in-base transmitted illumination system 6V20W Halogen lamp or 3W LED lamp. § Complete in a STYROFOAM molded box with dust cover, and -other accessories like mirror unit & power cord 1.5m in length. Easy Observation, Intelligent Operation" In conjunction with its excellent cost-performance ratio, the BXL LCD uses 8 inch LCD display and 5MP camera which is excellent for advance bright field applications. 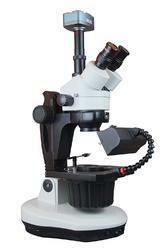 We are manufacturer of Digital LCD USB Microscopes. Stand: Single mold sturdy stand with anti rust materials. Extended base for better stability. Observation Head: Siedentopf BINOCULAR observation head inclined at 30o rotatable at 360o. Phototube for photomicrography. Interpupillary distance adjustable between 48-75mm. Diopter adjustment ring on ocular provides correction for eye acuity. Camera and LCD display: 8 inch LCD screen. Built-in digital camera with RCA, S-Video & USB-2 output with 5MP Resolution. Internal media card reader/writer. Eyepiece: Wide Field Eyepiece 10x (PAIRED) FOV 18mm. Nosepiece: Reverse angle quadruple nosepiece revolves on ball bearing with positive indexing. Soft rubber knurled grip on nosepiece. Plan Achromatic 100X Oil (SL). Stage: Size 125x135mm, supported on ball bearing guide ways and having low positioned co-axial controls for stage movement. Focusing: Co-axial focusing control with ball bearing guideways & large knobs, pre focusing lever & tension adjustment ring. The slow motion has 1DIV=0.002mm. Condenser: Sub stage abbe condenser NA 1. 25 having a spherical lens, adjustable iris diaphragm and swing out filter holder. Flip type front lens condenser. Illumination: Incorporates 6V/20W halogen lamp with adjustable iris diaphragm. Siedentopf Binocular/Trinocular tube, inclined at 30° rotatable through 360° with IPD 55-75 mm. Anti fungus treated. Focussable Eyepiece WF 10x FN 22 paired with eye guards, anti-fungus treated. Low friction & fully parafocal Reverse angle quadruple Revolving nosepiece (Ball bearing type) with click stop & rubber grip. Ergonomic low position co-axial coarse and fine focusing system on ball bearing guideways. Tension MODULE adjustment ring provided. Fine Graduation 2-3 micron. Ceramic coated rackless Double layer graduated mechanical rectangular stage size 140 x 132mm wire cross travel 75 (X) x 50 (Y) mm on ball bearing co-axial controls spring clip specimen holder. Universal Power Supply 100 V to 240 V,AC 50-60 Hertz, CE Compliant. Upgradeable to Fluorescence attachment with battery backup. · Vertical phototube for micro photography. · Binocular observation heads inclined at 30° fixed on adjustable stands. (Four Sets). 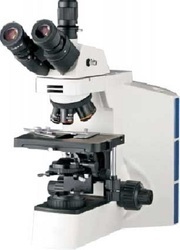 · Co-axial focusing control with large knob, Pre focusing lever & tension adjustment ring. · Reverse angle sextuple nosepiece revolving on ball bearings. · Mechanical stage size 185mmX142mm & having low positioned co-axial controls on ball bearing guide ways. · Wide field Eyepiece 10X (paired) F.O.V. 22mm. · Swing out top lens. Condenser N.A 0.9/1.25 with swing out filter holder. Iris diaphragm. · Color LED pointer, brightness adjustable. · Koehler's illumination system with 12V-100W halogen lamp, adjustable brightness. · Blue & grey filters, halogen bulb 12V/100W, operating manual, dust cover, guarantee card, Styrofoam boxes. Two Years And One Years On Electrical. · Siedentopf observation head inclined at 30 rotatable at 360. · Diopter adjustment ring on ocular tube. · Inter-pupillary distance from 48mm to 75mm. · Binocular observation heads, inclined at 30º Fixed on adjustable stand (Five sets). 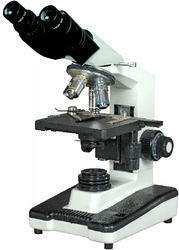 · Co-axial focusing system with large knobs, PRE-FOCUSING LEVER & TENSION ADJUSTMENT RING. · Reverse angle septuple nosepiece on ball bearing. Slot for Polarizer & DIC. · Double plate Reckless layer Mechanical stage is 187mmX167mm. · The mechanical stage has low positioned co-axial controls on ball bearing guide ways. · Fine division 0.001mm corse, per rotation, fine stroke 0.1mm per rotation, moving range : 80mm X 55mm. · Built in transmitted filter LBD/ND6/ND25. Extra wide field 10X (paired). · Dual Color LED Pointer Brightness adjustable. · Swing out front lens, abbe condenser N.A. 0.9/1.25, filter holder and iris diaphragm. · 12V/100W halogen lamp house for transmitted light, centre pre-set, intensity adjustable. · 12V/100W halogen tungsten bulb. · Power cord and cedar oil. ¿¿¿ Co-axial focusing control with large knob, pre-focusing lever & tension adjustment ring. ¿¿¿ Reverse angle sextuple nosepiece revolving on ball bearings. ¿¿¿ Rackless Mechanical stage size 187mm x 167mm & having low positioned co-axial controls on ball bearing guide ways. ¿¿¿ Fine div 0.001mm, coarse stroke 37.7mm per rotation, Fine stroke 0.1mm/rotation .Moving range 24mm. ¿¿¿ Side and top observation head inclined at 30° rotatable at 360°. ¿¿¿ Interpupillary distance from 50mm to 75mm. Koehler's illumination system with 100W halogen external illuminator. Aspherical collector. Brightness control knob. Swing out front lens, abbe condenser N.A. 0.9/1.25, filter holder and iris diaphragm. Eyepiece: Wide field 10X (Paired) F.O.V. 25mm. Camera and LCD display: 10 inch LCD screen. Built-in digital camera with HDMI & USB-2 output with 16MP Resolution. Internal media card reader/writer. Complete laptop with windows 10 operating system. Advanced software with measurement, calibration features along with count & classification. 6V/30W halogen tungsten bulb, dust cover, blue filter, guarantee card operating manual and styrofoam molded pack. Camera and LCD display: 8 inch LCD screen. Built-in integrated 5MP digital camera with Ethernet HDMI USB & Ipiad connections output with 5MP Resolution. Internal media card reader/writer. Siedentopf Trinocular tube, inclined at 30° rotatable through 360° with IPD 55-75 mm. Anti fungus treated. Stage: mechanical stage Size 140x133mm, supported on ball bearing guide ways and having low positioned co-axial controls for stage movement. Condenser: Sub stage abbe condenser NA 1. 25 having a spherical lens, adjustable iris diaphragm and swing out filter holder. Illumination: Incorporates Kohler illumination 3W LED lamp with adjustable iris diaphragm.